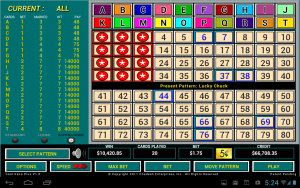 I doubt you are going of find a much faster casino game to play than Keno, for when playing any variant, you are going to be able to rattle through a huge number of games in a very short space of time. However, what you should always be aware of when playing any casino game and completely random game such as Keno that is a fast playing game, is that you need to know which the best betting opportunities are to place when playing such games. If you do not make a point of finding out just which number groupings have been designed to have the highest pay-out percentages and end up playing a low paying number grouping, then you could and most likely will bust out your bankroll very quickly. Bu knowing just which those number groupings are, and what the RTP’s are you can then always make sure you play just those number groupings, and by doing so over your long term play you will get more winning pay-outs and more of your stakes returned to you as winning pay-outs. Playing at any instant play no download casino site that offers you the range of NetEnt casino games you will come across a game known as the NetEnt Jungle Keno game, when playing that variant of Keno the only number grouping you should be placing is the 9 number spot bet, for by doing so you will then benefit from the highest paying bet by virtue of its RTP which for reference is a high 96.28%! The Krazy Keno game is also available at several different casino sites, and if you come across that variant then the best number grouping to place your bet on is the 10-number bet, for that one comes with the highest long term expected RTP which for reference is 96.00%. There is a standard Keno game that has the same pay table on offer on it and casinos that use Microgaming, Top Game and the Rival Gaming range of games will have that standard Keno game on offer. When playing that game always make a point o placing only the 13-number spot for that betting opportunity offers the higher possible RTP that being 94.90%. I would advise you however to steer clear of playing the standard Keno game available at NetEnt powered casinos, for it is not as high paying as the Jungle Keno variant from NetEnt. The highest paying number grouping on that standard variant of Keno is the 6-number spot, but that betting opportunity comes with a long term expected pay-out percentage of a low and unappealing 92.09%, which is not going to excite or appeal to any value seeking Keno game player!